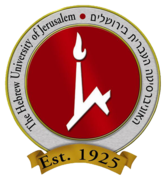 Ranked among the top academic and research institutions worldwide, the Hebrew University of Jerusalem is Israel's leading university and premier research institution. Serving 23,000 students from 70 countries, the Hebrew University produces a third of Israel’s civilian research and is ranked 12th worldwide in biotechnology patent filings and commercial development. The Hebrew University was founded in 1918 by visionaries including Albert Einstein, Sigmund Freud, Martin Buber and Chaim Weizmann. It is located on three campuses in Jerusalem and a fourth in Rehovot. Visit the website at http://new.huji.ac.il/en. The Wonders and Challenges of Bible Education via Coursera 2-4 hours a week , 7 weeks long 2-4 hours a week , 7 weeks long 29th Apr, 2019 No reviews yet. Israel State and Society via Coursera 14 weeks long 14 weeks long 13th May, 2019 No reviews yet.